Its not the ending I had planned. I had imagined I would cleverly be revealing to you some grand fireworks style ending where I announced our signing of a deal and where you would be able to find us on TV, but as I sit here now I realize that that type of announcement pales in comparison to what has actually happened. See a funny thing transpired on the way to me boldly declaring that we would get a deal; I became a woman who can make deals, the rest is just the details. No my fears began where the creation process would inevitably end, that moment when you’ve done all you can do and its time to start selling. I had developed an almost phobic level fear about selling, but I couldn’t see it because every time I finished a project I would just make up another excuse that I was happy to believe and then get busy with a new project. I didn’t know it at the time but starting this blog was the beginning of the end for my 15 years plus phobia because I had given myself no way out. As I inched closer to having nothing left to do but sell I got squirmy, seriously squirmy, like a caged animal squirmy, but with nowhere to go, and lots of willfulness and camaraderie (thanks Mhairi, Stephanie, Anne and Shonda Rhimes who doesn’t even know she helped but boy did she) I pushed through. I doubled down, bought books that inspired me (The Year of Yes, A Carlin Home Companion, The Comedians, Sick in the Head and Small Screen Big Picture), and finally took the time to develop some important sales tools like pitching. I got serious about networking and really honest with myself about some pretty serious career missteps that needed to be corrected. I faced my fears head on and what I was left with was that feeling one has after breaking the spell of a bad relationship where you’re suddenly able to see things you could never see before, only the bad relationship was with me, and what I could now see was that I’ve had the ability to do everything I’ve ever wanted to do all along. It was me that told myself I couldn’t and like it or not there is just no way to sell people on the idea that you can, when deep down you believe you can’t. So that’s where I sit now. 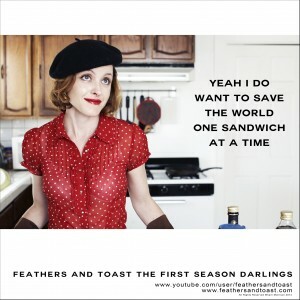 I know in a way I’ve never known before that I can do whatever I set my mind to and that its only a matter of time before Mhairi and I succeed in our mission to produce & distribute what will become a beloved show about a girl who saves the world one sandwich at a time. If you want something, declare it, and then be willing to do whatever it takes to make it true. And I leave you with a song that just about sums it all up. Enjoy!